Eye color in dogs is determined by the type and amount of pigment in the iris of the eye. 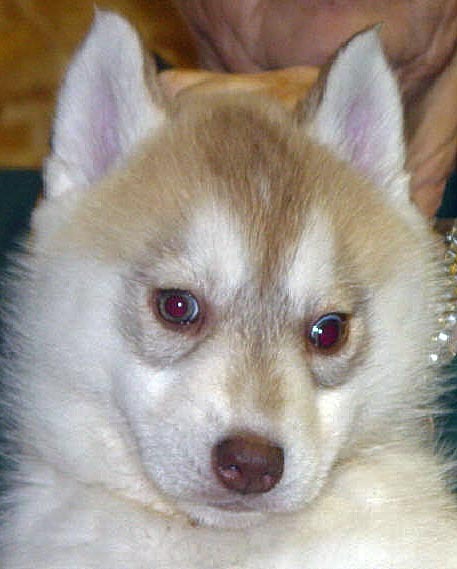 In Malamutes and Siberians the default eye color is Brown. 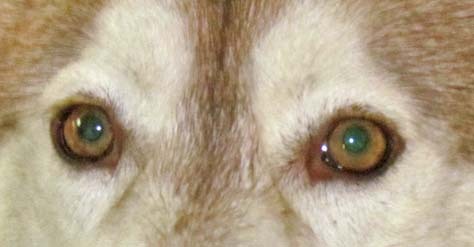 While brown is the basic eye color for all of the sled dog breeds, the shade of brown varies dramatically between individual dogs. The different shades are not each controlled by separate genes, but instead modifiers are at play. Modifiers are responsible for the minor differences in coat length, coat color, and even eye color on otherwise genetically identical dogs. Thus a Malamute or Siberian can have eyes that range anywhere from a pale yellowish brown, through more orange tone, right up to being such a dark brown that they appear almost black. In general evidence suggests that the modifiers for light eyes are more dominant than those for dark eyes, however it is important to understand that this is not a simple dominant/recessive relationship and that there may be more than one modifier involved in determining the shade of the eye. 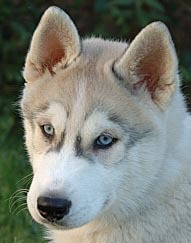 Thus achieving the dark eyes preferred in Malamutes requires selecting for this characteristic over time and generations. There is an enormous amount of mythology in various breeds regarding the reasons for preferred eye color and shade. The reality is that I have never found any scientific evidence that any shade of eye color is more functional than another. No good dog is a bad color, and for the most part that statement extends to eye color as well. 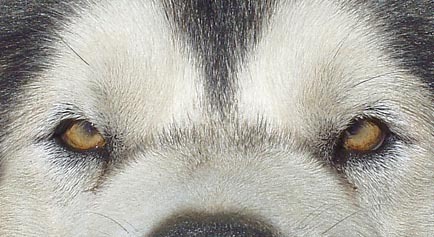 In Malamutes and many other breeds (but not Siberians), dark brown eyes are strongly preferred. Again, there is an incredible amount of mythology surrounding this characteristic. It is very important to note that wild canid populations worldwide have quite a bit of variation in eye color. Irregardless of the environment they live in most of the population falls within the lighter shades, and they almost always have lighter colored eyes than most domestic dogs. If dark eyes had a functional advantage there would be considerably more selection against the lighter shades in wild canids. The “preference” for dark eyes appears to have little to do with function and considerably more to do with human perception. Light eyes give the dog a “harder” look. 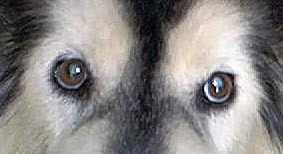 In a light eyed dog the pupil is very visible and this makes it easy to see exactly where the dog is looking. For most humans the resulting clearly visible direct stare results in an unconscious perception of threat. This is actually capitalized on by a few guardian breeds for whom light eyes are the stated preference. Dark brown eyes soften the dog’s expression, make it very difficult to see the pupil, and thus give the dog a much friendlier appearance. It is absolutely true that dark eyes contribute greatly towards the “soft expression” called for in the Malamute standard. As such they can be considered important from a cosmetic perspective. It should be noted, however, that there is no factual evidence for the idea that there is a functional basis for dark eyes in the breed. 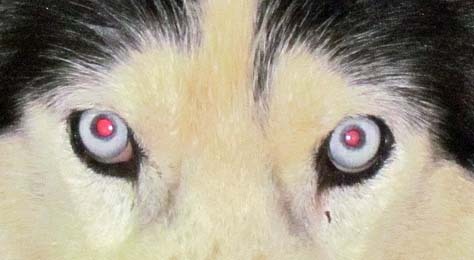 While the shade and color of the eyes in Malamutes and Siberians are not strictly determined by coat color, there are several coat colors which do have an effect on the color of the eyes. Red (genetically brown “bb”) – The brown locus is responsible for changing black (eumelanin) pigment to chocolate brown wherever it appears on the dog. This includes the eyes of the dog. It is normal for the eyes on a red dog to be lighter in appearance and have a gold or orange tone. The resulting color is often referred to as Amber. Blue (genetically dilute “dd”) – The dilute locus is responsible for changing black (eumelanin) pigment to a dark slate gray and for taking the red tones out of red/yellow (phaeomelanin) pigment. Once again this includes the eyes of the dog. The resulting eye color is yellow, often with a gray or blue cast. The Malamute standard is very clear. Blue eyes are not allowed in the breed under any circumstances. Many people have wondered why this particular characteristic is viewed so strongly. 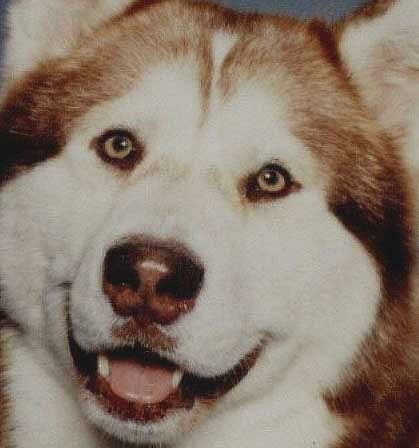 My understanding is that the disqualification was added to the standard many years ago after a “Malamute” was shown who had blue eyes and obvious Siberian Husky heritage. Since that time there have been numerous cases of pet stores selling both breeds and mixing up the paperwork, as well as blue eyed Malamutes registered by less reputable kennel clubs who are clearly Siberian mixes. Beyond that, there is a good genetic reason by blue eyes are a disqualification in Malamutes. The dominant gene that causes blue eyes in Siberian Huskies is a very specific mutation that historically never occurred in the Malamute population. Blue eyes are never mentioned in the old literature prior to the introduction of the Siberian Husky. So while the dominant gene that causes blue eyes does not cause any issues from the standpoint of a dog being a good sled dog, it is a characteristic that simply should not occur genetically in Malamutes. It is true that a random mutation could occur and a purebred Malamute could be born with blue eyes. Just as one could be born with a curly coat, or a ridge like a Ridgeback. The odds of the mutation for any of these characteristics occurring randomly in the breed are astronomically small. 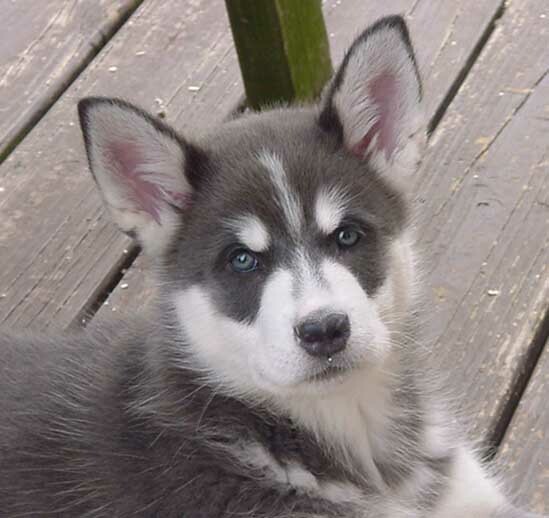 The FAR more likely explanation for true blue in a Malamutes eyes is that there is a medical issue, or that the dog has a Siberian in its pedigree and is not a purebred Malamute. Thus the reason for the characteristic being a disqualification in the standard. 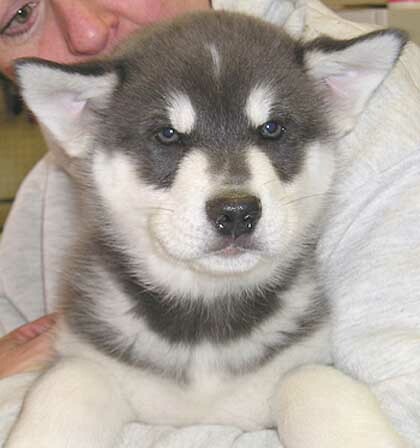 That said, there are cases where Malamutes can and do have surprisingly blue appearing eyes. In particular some young puppies have eyes with a startlingly blue appearance. These aren’t true blue eyes as seen in Siberian Huskies, but are instead usually the product of the pigment in the eye being diluted by the brown or the dilute gene. Blue Malamutes in particular often start life with gray or gray-blue eyes, sometimes even a bright enough shade to be alarmingly similar to those seen in Siberians. 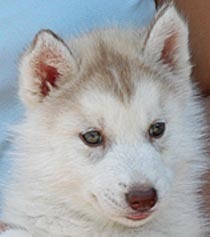 In these Malamutes, however, the blue fades as they mature and as adults the dogs have hazel, amber, or yellowish eyes. The blue eyes seen in Siberians are caused by a gene which only affects the eyes, and is not connected to coat color. While there have been no definitive studies, blue eyes in Siberians appears to be a dominant characteristic with extremely variable expression. In humans we have long been told that blue eyes are a simple recessive characteristic. In truth the genetics turn out to be more complicated, however that basic principal taught to us in biology classes way back when has caused a great deal of confusion regarding blue eyes in the Siberian Husky. Blue eyes in Siberian Huskies is a dominant gene. Due to its dominant nature, only one parent has to have the blue eyed gene to produce puppies with blue eyes. Also, unlike blue eyes in humans, the Siberian blue eyed gene varies greatly in how it is expressed in individual dogs. The same gene which produces solid blue eyes in one dog may produce nothing more than a sliver of blue in another dog. And it is possible for a dog who has the gene for blue eyes to not express the trait at all. This characteristic is very random in how it is expressed. Looking back at the historical record that pre-dates a written standard, there is good evidence that this particular characteristic (blue eyes) did not occur in the landrace base population from which our modern day Malamutes descended. There is likewise good evidence that the gene did occur in the original group of dogs that formed the foundation of the Siberian Husky. Therefore it is appropriate from a historical perspective to state that blue eyes do not occur in Malamutes. It is also appropriate from a modern day perspective of defining breeds and differentiating between Malamutes and Siberians based on a genetic characteristic which does not occur in both breeds. The remaining three causes of blue eyes in dogs are all connected to coat color, and specifically to a lack of pigment. Merle – The merle gene causes random uneven patches of diluted/missing pigment over the body of the dog. This gene has the same effect on the Iris of the eye, turning part or all of the eye blue. Also a dominant gene, this is the most common cause of blue eyes in dogs. It does not, however, occur in any of the sled dog breeds. White Spotting / Piebald – Seen most often in breeds selected for heavy white spotting, the lack of pigment that causes the white spots in the coat may include the iris of the eye. No pigment = Blue eye. This can involve both eyes, or only one eye. 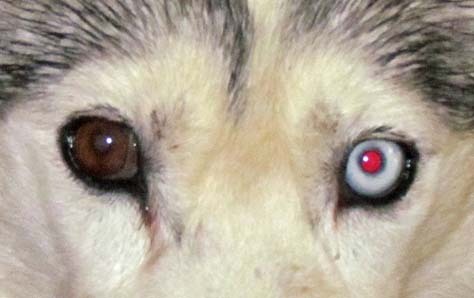 This is seen in Siberians, and in such a dog you would have no way to tell just by looking if a blue eye was caused by the dominant blue eye gene or by a lack of pigment due to white spotting. 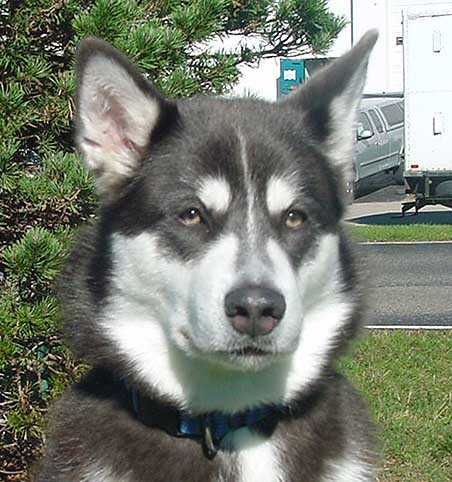 While EXTREMELY uncommon there are at least two cases where this has been seen in Malamutes. Thus it is possible for a Malamute to have a blue eye due to the white spotting gene. Due to the selection AGAINST heavy white spotting in the breed this is extremely unusual and uncommon. Albino – There are no confirmed cases of true albino in dogs. There are, however, a few cases of dogs who’s coats show very similar effects – most notably white Dobermans. They have pale beige colored fur, pink skin, pink noses and eye rims, and blue eyes. Shown to not be true genetic albinos (the color is not caused by an allele on the “C” locus), at this point it has not been determined what the exact genetics are for these dogs. What is known is that it’s a simple recessive gene which causes a dilution of pigment over the entire body of the dog. There are also a few random reports of possible recessive blue eyes occurring in a couple breeds. I don’t know of any case where this has been proved conclusively.